Apple Allows installing New MacOS Mojave Developer Beta without Developer account to Any Compatible Mac Computer. Is your Mac running Latest version of MacOS Mojave or MacOS Developer, or MacOS Mojave public Final version? Follow the steps for Downgrade From MacOS Mojave to MacOS High Sierra or Earlier. The official MacOS Mojave is not released, so it is obvious you have to overcome the stack of bugs, it depends on your tolerance limit. However, we always give one chance to every update and try to get the most out of it. However, if you are not happy with macOS Mojave and its silly bugs, then there’s a way through which you can downgrade macOS Mojave beta 6 to macOS High Sierra, the stable version. Eventually, you have to wait for a few more days to enjoy a correct version of macOS Mojave. For now, downgrade to macOS High Sierra and get rid of unexpected errors. NOTE: Backup Mac because everything will be erased soon if you are ready to downgrade macOS Mojave to macOS High Sierra. Note: Keep Connect Your Mac to Internet Connection During Whole Setup. Before to remove data from your Mac running on MacOS Mojave, You have to prepare to keep a backup in Time Machine. Otherwise, You lost all data, if you skip this step. Be Ready with New and latest Version of MacOS installation Drive. Yes, we can set up on our existing Pen drive that works as a Bootable Pen Drive for MacOS. Read and Follow: Create Bootable Pen drive for MacOS Mojave. Step 1: Restart the Mac from the “Apple” menu located on the top of the bar. Step 2: Also, Hold down the “Command + R” until your Mac restarts. Step 3: Now, your Mac is in recovery mode. Step 5: Select “Startup Disk” and click on “Erase” tab which you will find on the top of the screen. Step 7: Next, select “MacOS Extended (Journaled)” format if your Mac is operating on HFS+ and another option is select APFS if Mac is on APFS. Step 10: Finally your Mac is erased, and now it’s time to get back to the “OS X Utilities” window. So macOS Mojave is successfully uninstalled from Mac and here the time comes to reinstall the macOS High Sierra. 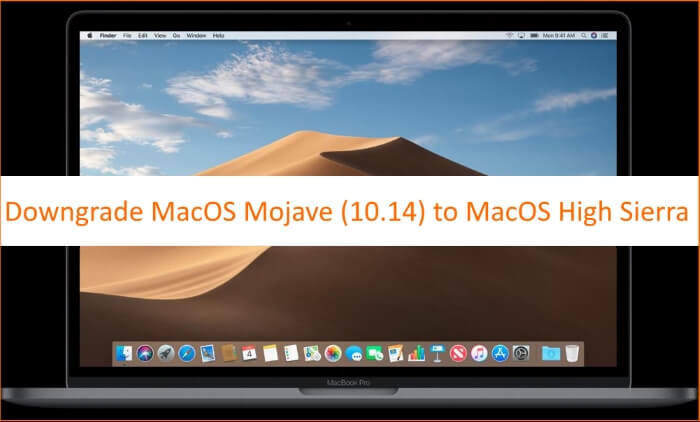 If your Mac was shipped with macOS High Sierra or you are running it from the beginning, then it is straightforward to install MacOS Mojave on Mac. Alternatively, you can follow further tutorial. Step 1: From the “Apple” icon “restart” the Mac. Step 2: Next, hold down the “Option” button and “select the startup disk.” That means your bootable drive with High Sierra. Step 3: Move forward by clicking “Continue,” and “MacOS Mojave installation screen” will appear. Accept the terms and conditions, and afterward, Mac will reboot. Step 1: Click on the “Apple” menu and Reboot Mac. Step 2: Hold down the “Command+R” keys until Mac restarts. Restoring to MacOS Mojave will take time, take a rest and Come back with Old MacOS Mojave. Happy visiting and Enjoy, Also Don’t miss to like this and share with your Friends. Put comment us in below for improvements and tips from us.